Businesses have a wide range of choices for online collaboration vendors. 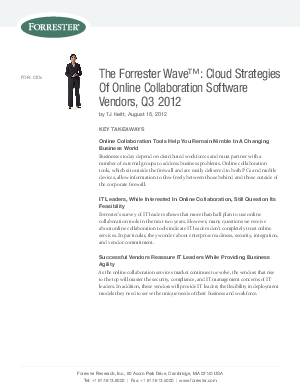 Forrester performed a 38-point evaluation of eight prominent collaboration service providers in categories such as global footprint, mobile support, service-level agreements and more, to see how each performed. Read this paper to learn the results and gain valuable insight into prospective providers of online collaboration services.